From the moment your child opens one of our personalised books, the magical adventure begins. These will be books that your child will cherish forever. 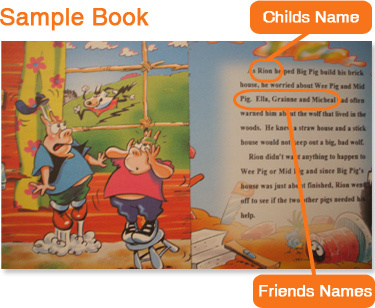 Each of our books are fully personalised with important information about your child. Stories include information such as your child's name, friends' names, hometown, child's age, dedication page and much more! Our durable construction has big bold laser type and full colour illustrations throughout, with washable hard covers. They are sure to become a treasured keepsake. Why not contact us for more information.